Edmund Charles Blunden, CBE, MC (1 November 1896 – 20 January 1974) was an English poet, author and critic. Like his friend Siegfried Sassoon, he wrote of his experiences in World War I in both verse and prose. For most of his career, Blunden was also a reviewer for English publications and an academic in Tokyo and later Hong Kong. He ended his career as Professor of Poetry at the University of Oxford. He was nominated for the Nobel Prize in Literature six times. Born in London, Blunden was the eldest of the nine children of Charles Edmund Blunden (1871–1951) and his wife, Georgina Margaret née Tyler, who were joint-headteachers of Yalding school. Blunden was educated at Christ's Hospital and The Queen's College, Oxford. In September 1915, during World War I, Blunden was commissioned as a second lieutenant into the British Army's Royal Sussex Regiment. He was posted to the 11th (Service) Battalion (1st South Down), Royal Sussex Regiment, a Kitchener's Army unit that formed part of the 116th Brigade of the 39th Division in May 1916, two months after the battalion's arrival in France. He served with the battalion on the Western Front to the end of the war, taking part in the actions at Ypres and the Somme, followed in 1917 by the Battle of Passchendaele. In January 1917, he was awarded the Military Cross (MC) for "conspicuous gallantry in action". Blunden survived nearly two years in the front line without physical injury (despite being gassed in October 1917) but, for the rest of his life, he bore mental scars from his experiences. With characteristic self-deprecation he attributed his survival to his diminutive size, which made "an inconspicuous target". His own account of his experiences was published in 1928, as Undertones of War. 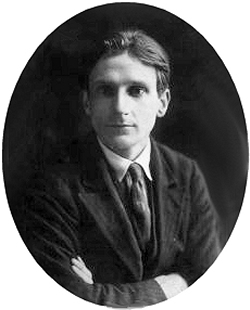 Blunden left the army in 1919 and took up the scholarship at Oxford that he had won while he was still at school. On the same English literature course was Robert Graves, and the two were close friends during their time at Oxford together, but Blunden found university life unsatisfactory and left in 1920 to take up a literary career, at first acting as assistant to Middleton Murry on the Athenaeum. An early supporter was Siegfried Sassoon, who became a lifelong friend. In 1920, Blunden published a collection of poems, The Waggoner, and with Alan Porter, he edited the poems of John Clare (mostly from Clare's manuscript). Blunden's next book of poems, The Shepherd, published in 1922 won the Hawthornden Prize, but his poetry, though well reviewed, did not provide enough to live on. In 1924, he accepted the post of Professor of English at the University of Tokyo. He returned to England in 1927, and was literary editor of the Nation for a year. In 1927, he published a short book, On the Poems of Henry Vaughan, Characteristics and Intimations, with his principal Latin poems carefully translated into English verse (London: H. Cobden-Sanderson, 1927), expanding and revising an essay that he had published, in November 1926, in the London Mercury. In 1931, he returned to Oxford as a Fellow of Merton College, where he was highly regarded as a tutor. During his years in Oxford, Blunden published extensively: several collections of poetry including Choice or Chance (1934) and Shells by a Stream (1944), prose works on Charles Lamb; Edward Gibbon; Keats's publisher; Percy Bysshe Shelley (Shelley: A Life Story); John Taylor; and Thomas Hardy; and a book about a game he loved, Cricket Country (1944). He returned to full-time writing in 1944, becoming assistant editor of The Times Literary Supplement. In 1947, he returned to Japan as a member of the British liaison mission in Tokyo. In 1953, after three years back in England he accepted the post of Professor of English Literature at the University of Hong Kong. Blunden retired in 1964 and settled in Suffolk. In 1966, he was nominated for the Oxford Professorship of Poetry in succession to Graves; with some misgivings, he agreed to stand and was elected by a large majority over the other candidate, Robert Lowell. However, he now found the strain of public lecturing too much for him, and after two years, he resigned. He died of a heart attack at his home at Long Melford, Suffolk, in 1974, and is buried in the churchyard of Holy Trinity Church, Long Melford. Blunden was married three times. While still in the army, he met and married Mary Daines in 1918. They had three children, the first of whom died in infancy. They divorced in 1931, and in 1933, Blunden married Sylva Norman, a young novelist and critic. That marriage, which was childless, was dissolved in 1945. The same year, he married Claire Margaret Poynting (1918–2000), one of his former pupils; they had four daughters. While in Japan in the summer of 1925, he met Aki Hayashi, and he began a relationship. When Blunden returned to England in 1927, Aki accompanied him and would become his secretary. The relationship later changed from a romantic one to a platonic friendship, and they remained in contact for the rest of her life. The test of a true cricketer is that he shall prefer village cricket to 'good' cricket [.... Blunden's] friendliest memories are of the informal village game, where everyone plays in braces, where the blacksmith is liable to be called away in mid-innings on an urgent job, and sometimes, about the time when the light begins to fail, a ball driven for four kills a rabbit on the boundary. Any cricket book that talks easily of Henry James and Siegfried Sassoon and Ranji and Grace and Richard Burton (the writer, not the actor) and Coleridge is bound to have a special charm of its own. As Blunden says, "The game which made me write at all, is not terminated at the boundary, but is reflected beyond, is echoed and varied out there among the gardens and the barns, the dells and the thickets, and belongs to some wider field." Perhaps that is what all books on cricket are trying to say. Blunden had a robust sense of humour. In Hong Kong, he relished linguistic misunderstandings such as those of the restaurant that offered "fried prawn's balls" and the schoolboy who wrote, "In Hong Kong there is a queer at every bus-stop". His fellow poets' regard for Blunden was illustrated by the contributions to a dinner in his honour for which poems were specially written by Cecil Day-Lewis and William Plomer; T. S. Eliot and Walter de la Mare were guests; and Sassoon provided the Burgundy. Blunden's public honours included the C.B.E., 1951; the Queen's Gold Medal for Poetry, 1956; The Royal Society of Literature's Benson Medal; the Order of the Rising Sun, 3rd Class (Japan), 1963; and Honorary Membership of the Japan Academy. On 11 November 1985, Blunden was among 16 Great War poets commemorated on a slate stone unveiled in Poets' Corner in Westminster Abbey. The inscription on the stone was written by fellow World War I poet Wilfred Owen: "My subject is War, and the pity of War. The Poetry is in the pity." Blunden's output was prolific. To those who thought that he published too much he quoted Walter de la Mare's observation that time was the poet's best editor. His books of poetry included Poems 1913 and 1914 (1914); Poems Translated from the French (1914); Three Poems (1916); The Barn (1916); The Silver Bird of Herndyke Mill; Stane Street; The Gods of the World Beneath, (1916); The Harbingers (1916); Pastorals (1916); The Waggoner and Other Poems (1920); The Shepherd, and Other Poems of Peace and War (1922); Old Homes (1922); To Nature: New Poems (1923); Dead Letters (1923); Masks of Time: A New Collection of Poems Principally Meditative (1925); Japanese Garland (1928); Retreat (1928); Winter Nights: A Reminiscence (1928); Near and Far: New Poems (1929); A Summer's Fancy (1930); To Themis: Poems on Famous Trials (1931); Constantia and Francis: An Autumn Evening, (1931); Halfway House: A Miscellany of New Poems, (1932); Choice or Chance: New Poems (1934); Verses: To H. R. H. The Duke of Windsor, (1936); An Elegy and Other Poems (1937); On Several Occasions (1938); Poems, 1930–1940 (1940); Shells by a Stream (1944); After the Bombing, and Other Short Poems (1949); Eastward: A Selection of Verses Original and Translated (1950); Records of Friendship (1950); A Hong Kong House (1959); Shelley, A Life Story (1965) by Oxford University Press, with strong evidence on pp. 278 and 290 that Percy Bysshe Shelley was murdered; Poems on Japan (1967). Artists Rifles, an audiobook CD published in 2004, includes a reading of Concert Party, Busseboom by Blunden himself, recorded in 1964 by the British Council. Other World War I poets heard on the CD include Siegfried Sassoon, Edgell Rickword, Graves, David Jones and Lawrence Binyon. Blunden can also be heard on Memorial Tablet, an audiobook of readings by Sassoon issued in 2003. ^ "Nomination Database". www.nobelprize.org. Retrieved 2017-04-18. ^ "No. 29290". The London Gazette. 10 September 1915. p. 8993. ^ "No. 29921". The London Gazette (Supplement). 26 January 1917. p. 1016. "For conspicuous gallantry in action. He displayed great courage and determination when in charge of a carrying party under heavy fire. He has previously done fine work." ^ Barry Webb, Edmund Blunden: A Biography, p. 151. ^ Quoted in Menon 2009. ^ "Poets". net.lib.byu.edu. Retrieved 26 October 2018. ^ Means, Robert. "Preface". net.lib.byu.edu. Retrieved 26 October 2018. ^ "Automatic Redirect". www.ltmrecordings.com. Retrieved 26 October 2018. Menon, Suresh. "The passionate poet." Cricinfo, 5 April 2009. Bacchus and Ariadne is a poem by Leigh Hunt written and published in 1819. The result of three years of work, the poem tells the Greek myth of Hero and Leander, two lovers, and the story of their forlorn fate. Hunt began working on the poem during the summer of 1816, arousing the interest of the publisher John Taylor, and despite repeated delays to allow Hunt to deal with other commitments the poem was finished and published in a collection 1819. Hunt later claimed in a poem about Bacchus and Ariadne that he was seeking to humanise myths and make them more understandable to the common people. The collection was well received by contemporary critics and poets, including Thomas Carlyle, while more modern writers such as Edmund Blunden have criticised the flow of its narrative. The Benson Medal is a medal awarded by the Royal Society of Literature in the UK.It was founded in 1916 by A. C. Benson who was a Fellow of the Society, to honour those who produce "meritorious works in poetry, fiction, history and belles-lettres". The medal has been awarded several times to writers in other languages, and is occasionally awarded those who are not writers, but who have done conspicuous service to literature. The Corvinus Press was a private press established by George Lionel Seymour Dawson-Damer, Viscount Carlow (1907–1944) in Red Lion Court, off Fleet Street, London in early 1936. Carlow was a keen book-collector, amateur linguist and typographer, and ran the Press purely as a hobby, with the help of a press-man (latterly Arthur Harry Cardew) and secretary. He was friendly with many of the leading literary figures of the age, some of whom allowed him to print their works at his Press. Corvinus published new work by T. E. Lawrence, James Joyce, Wyndham Lewis, Edmund Blunden, Stefan Zweig, Walter de la Mare and H. E. Bates. Carlow was interested in contemporary European typography, and bought new types from the Bauer typefoundry at Frankfurt am Main and other European founders, which he often used in an experimental way at the Corvinus Press. His taste in binding was also individual, and he generally produced a few special copies of each book which he had bound by one of the leading craft bookbinders of the age. During the war, Carlow undertook diplomatic duties elsewhere in Europe, but oversaw the work of the Press at a distance. He was killed in an aeroplane crash on 17 April 1944. The Press continued to operate for around a year while Cardew completed some of the books which Carlow had chosen for publication, before the printing equipment and press-man were acquired by the Dropmore Press in 1945. Forgotten Voices of the Great War is a collection of interviews with people who lived through the First World War.The book is part of the Imperial War Museum's oral archive. In 1960, the Imperial War Museum began a momentous and important task. A team of academics, archivists and volunteers set about tracing WWI veterans and interviewing them at length in order to record the experiences of ordinary individuals in war. The IWM aural archive has become the most important archive of its kind in the world. Authors have occasionally been granted access to the vaults, but digesting the thousands of hours of footage is a monumental task. Author Max Arthur puts the interviews into chronological and campaign order, and provides some context about the events that surround the memories. The book includes testimonies from Harry Patch, Philip Neame, Horace Birks, Edmund Blunden, Douglas Wimberley, Mabel Lethbridge, Reginald Leonard Haine, Edward Spears, Godfrey Buxton, Henry Williamson, Tom Adlam, Cecil Arthur Lewis, Montagu Cleeve, Charles Carrington, Keith Officer and Norman Demuth. Now, forty years on, the Imperial War Museum has at last given author Max Arthur and his team of researchers unlimited access to the complete WWI tapes. These are the forgotten voices of an entire generation of survivors of the Great War. The resulting book is an important and compelling history of WWI in the words of those who experienced it. This book has also been dramatized for the stage by the playwright Malcolm McKay. Georgian Poetry refers to a series of anthologies showcasing the work of a school of British poetry that established itself during the early years of the reign of King George V of the United Kingdom. The Georgian poets were, by the strictest definition, those whose works appeared in a series of five anthologies named Georgian Poetry, published by Harold Monro and edited by Edward Marsh, the first volume of which contained poems written in 1911 and 1912. The group included Edmund Blunden, Rupert Brooke, Robert Graves, D. H. Lawrence, Walter de la Mare, Siegfried Sassoon and John Drinkwater. It was not until the final two volumes that the decision was taken to include female poets. Hero and Leander is a poem by Leigh Hunt written and published in 1819. The result of three years of work, the poem tells the Greek myth of Hero and Leander, two lovers, and the story of their forlorn fate. Hunt began working on the poem during the summer of 1816, arousing the interest of the publisher John Taylor, and despite repeated delays to allow Hunt to deal with other commitments the poem was finished and published in a collection 1819. Dealing with themes of love and its attempt to conquer nature, the poem does not contain the political message that many of Hunt's works around that time do. The collection was well received by contemporary critics, who remarked on its sentiment and delicacy, while more modern writers such as Edmund Blunden have criticised the flow of its narrative. Juvenilia; or, a Collection of Poems Written between the ages of Twelve and Sixteen by J. H. L. Hunt, Late of the Grammar School of Christ's Hospital, commonly known as Juvenilia, was a collection of poems written by James Henry Leigh Hunt at a young age and published in March 1801. As an unknown author, Hunt's work was not accepted by any professional publishers, and his father Isaac Hunt instead entered into an agreement with the printer James Whiting to have the collection printed privately. The collection had over 800 subscribers, including important academics, politicians and lawyers, and even people from the United States. The critical and public response to Hunt's work was positive; by 1803 the collection had run into four volumes. The Monthly Mirror declared the collection to show "proofs of poetic genius, and literary ability", and Edmund Blunden held that the collection acted as a predictor of Hunt's later success. Hunt himself came to despise the collection as "a heap of imitations, all but absolutely worthless", but critics have argued that without this early success to bolster his confidence Hunt's later career could have been far less successful. The early-twentieth-century British composer Gerald Finzi (1901–1956) is recognized largely for several song cycles, setting texts from a wide selection English poets, including Thomas Traherne, William Shakespeare, John Milton, Christina Rossetti, Thomas Hardy, Robert Bridges and Edmund Blunden. However, his oeuvre includes well-regarded concerti for clarinet and cello, choral works, works for string orchestra, and chamber music. Born in London, Finzi was of German Jewish and Italian Jewish descent. But his compositions place him as among the most characteristically "English" composers of his generation. Despite being agnostic, he wrote some inspired and imposing Christian choral music that remains consistently in the performance repertoire. Old Came Rectory is a former rectory on the A352 road in Winterborne Came, Dorset, England. It was built in the 19th century for the Reverend William England in a rustic cottage orné style from a plan by the architect John Nash. It is a two-storey building with a thatched roof and walls of cob and rendered rubble. It was subsequently the home of William Barnes, who became the rector in 1862 and lived there until he died in 1886. Thomas Hardy visited him there many times, and other literary tenants and guests have included Tennyson, Coventry Patmore, Edmund Gosse, Francis Palgrave, Siegfried Sassoon, Edmund Blunden and T. E. Lawrence.The building was listed for protection as Grade II in 1956. Features include three thatched verandas, french windows and a large garden which contains an orchard and well. Poems was a quarto volume of poetry by Wilfred Owen published posthumously by Chatto and Windus in 1920. Owen had been killed on 4 November 1918. It has been described as "perhaps the finest volume of anti-war poetry to emerge from the War". The published volume included a sepia-toned photograph of the author in military uniform. It was edited by Owen's friend Siegfried Sassoon, with assistance from Edith Sitwell. Sassoon also wrote an introduction, including the words "The poems printed in this book need no preliminary introduction … All that was strongest in Wilfred Owen survives in his poems". The preface was found, in an unfinished condition, among Wilfred Owen's papers. The slim book was sold for six shillings. It included 23 poems, including some of his most famous work, such as including "Anthem for Doomed Youth" and "Dulce et Decorum Est". Only five of his poems had been published before his death, three in The Nation, and two in The Hydra. Seven were published by the Sitwells in 1919, in their annual anthology Wheels. Owen's reputation as a war poet was quickly established immediately after the end of the war. A further 19 poems were added in an expanded second edition, The Poems of Wilfred Owen published by Edmund Blunden in 1931, and the total reached 80 (together with other fragments) in the collected poems published by Cecil Day Lewis in 1963. A first edition copy of Poems was sold by Bonhams in 2015 for £6,250. Poems of Today was a series of anthologies of poetry, almost all Anglo-Irish, produced by the English Association. "Poetry and the Microphone" is an essay by English writer George Orwell. It refers to his work at the BBC’s Eastern Service broadcasting half-hour-long literary programmes to India in the format of an imaginary monthly literary magazine. Written in 1943, it was not published until 1945, in New Saxon Pamphlet. Orwell had by then left the BBC. Notable for including Orwell’s sentence: "Poetry on the air sounds like the Muses in striped trousers", the article mentions some of the material used in the broadcasts, mainly by contemporary or near-contemporary English writers such as T. S. Eliot, Herbert Read, W. H. Auden, Stephen Spender, Dylan Thomas, Henry Treece, Alex Comfort, Robert Bridges, Edmund Blunden, and D. H. Lawrence. Whenever possible, the authors themselves were invited to read their poems on the air. Orwell refers to the fact that placing the poet in front of a microphone and having to read his poem out loud has an effect not only on the audience but also on the poet. He states that over the past two hundred years poetry has come to have less connection with music and the spoken word, with lyrical and rhetorical poetry having almost ceased to exist. The key to broadcasting poetry was to engage the audience – of one – in order to avoid the "atmosphere of frigid embarrassment" of the “grisly” poetry readings which always contained some people who were bored or “all but frankly hostile and who couldn’t remove themselves by the simple act of turning a knob.” He points out that the unpopularity of poetry contrasts with the "good-bad" poetry, "generally of a patriotic or sentimental kind" and with "folk poetry", as in nursery rhymes, etc. extracts from "A Letter from Anne Ridler” by G. S. Fraser, Byron’s "Isles of Greece", and an extract from T. E. Lawrence’s Revolt in the Desert.The essay goes on to refer to the fact that broadcasting is "under the control of governments or great monopoly companies which are actively interested in maintaining the status quo and therefore preventing the common man from becoming too intelligent." He gives the example of the British Government which, at the beginning of World War II had declared its "intention of keeping the literary intelligentsia "out of it; yet after three years of war almost every writer, however undesirable his political history or opinions, has been sucked into the various Ministries or the BBC" or, if already in the armed forces, into public relations "or some other essentially literary job". He points out a small consolation in that "the bigger the machine of government becomes, the more loose ends and forgotten corners there are in it" and that as long as they are "forced to maintain an intelligentsia", there will also be a minimum of freedom. Finally, he urges those "who care for literature to turn their minds to this much-despised medium" which has "powers for good". The Indian Section of the BBC published a collection of the broadcasts, Talking to India (1943), which was edited by Orwell. Randolph Schwabe (9 May 1885 – 19 September 1948) was a draughtsmen, painter and etcher who was the Slade Professor of Fine Art at University College London from 1930 until his death. He served as a war artist in both World Wars, created designs for theatrical productions and illustrated a number of books. The Calendar of Modern Letters was a short-lived British literary review journal. It was established by the poet Edgell Rickword, and published from March 1925 to July 1927. Contributors included Edmund Blunden, Robert Graves, Siegfied Sassoon, D. H. Lawrence, E. M. Forster, Wyndham Lewis, Edwin Muir, Luigi Pirandello, Leonid Leonov, Alexander Nieverov, Isaac Babel, Hart Crane, Allen Tate and John Crowe Ransom. "But what established the journal's reputation and gave it, at all events in retrospect, its cachet was less its discovery of new voices than its combativeness as an organ of informed criticism." and the literary editor was Leonard Woolf, who would help impecunious young authors, including Robert Graves and E. M. Forster he knew through the Hogarth Press by commissioning them to write reviews and articles; there were others, such as Edwin Muir who had come to his attention at the Nation and whose work he would publish at Hogarth. Other contributors included Edmund Blunden, H. E. Bates, H. N. Brailsford, J. A. Hobson, Harold Laski, David Garnett, Aldous Huxley (under the pseudonym "Autolux"), Charlotte Mew, Edith Sitwell, T.S. Eliot, Virginia Woolf, and G. D. H. Cole.In 1931, it was absorbed into the Labour weekly the New Statesman, which was known as the New Statesman and Nation until 1964. Undertones or War is a 1928 memoir of the First World War, written by English poet Edmund Blunden. As with two other famous war memoirs-—Siegfried Sassoon's Sherston trilogy, and Robert Graves' Good-Bye to All That--Undertones represents Blunden's first prose publication, and was one of the earliest contributors to the flurry of Great War books to come out of England in the late 1920s and early 1930s. Voices was a monthly literary magazine published in England from 1919 to 1921. Under the editorship of Thomas Moult, Voices tried to create a new readership for poetry among the young generation awaiting demobilization or returning from the war".The first edition of Voices appeared in January 1919, costing one shilling. Following the February 1921 issue, the magazine only managed to publish a Summer and Autumn issue before folding.Some regular contributors, like Neville Cardus, came from Manchester, where Moult had been educated. Jewish contributors included Louis Golding, Maurice Samuel, and the Zionist poet Israel Zangwill; Stephen Winsten, the arts editor, was one of the so-called Whitechapel Boys group, and attracted contributions from David Bomberg, Jacob Kramer, Lucien Pissarro, and Jacob Epstein.The magazine reviewed war literature and published war poetry by soldier-poets such as Frederick Victor Branford and Edmund Blunden. Open to both Georgian and Modernist poetry, the magazine published artwork by avant-garde artists including Henri Gaudier-Brzeska, Wyndham Lewis, David Bomberg, Jacob Kramer, Edward Wadsworth, Lucien Pissarro, Paul Nash, Eric Gill, Edmund X. Kapp, Anne Estelle Rice, John Duncan Fergusson, and Robert Gibbings. However, several Voices critics used the war experience as an argument against modernist abstraction as "beauty for beauty's sake."